Gosh - I had fun with this one!!! I first saw this little fish a few weeks ago, on Shirley's blog, and made a mental note to myself that I'd have to get that tutorial and give it a try. It sat in my 'cart' for a while and finally I bought it. Then this past week, Karen, the designer of this tute contacted me to see if I wanted to be a part of the hop! So I put the projects on my trays away and put this fish on the top! Karen's directions are fantastic, and this fish will whip up in just a couple hours. Seriously - if I'd had more time before knowing about this challenge, I can't imagine how many more I would have made! There will definitely be more of these in my future and I can't wait to try more color combinations, bead variations and core variations!!! I first did a "large" fish. I liked it so much at this stage, I practically wanted to stop. *I want to note here, that I didn't have any of the correct oval flat beads for this projects. I improvised with a flat-ish bead, and also added a couple of 6/0 beads in the narrower part of the body. It wasn't ideal, but for my first try, I was still enjoying the shape. I kept going, but again, I liked the shape I didn't really want to cover it up with the side fins! LOL! Next up was a "small" fish. This time I used some felt glued together for the core. Love, love, love this little guy!!! 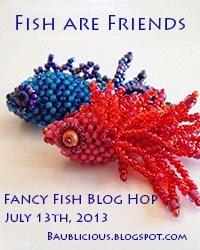 I am looking forward to seeing all the participants' fish! One thing I'm especially curious about is to see if/how everyone is planning on wearing the fish. 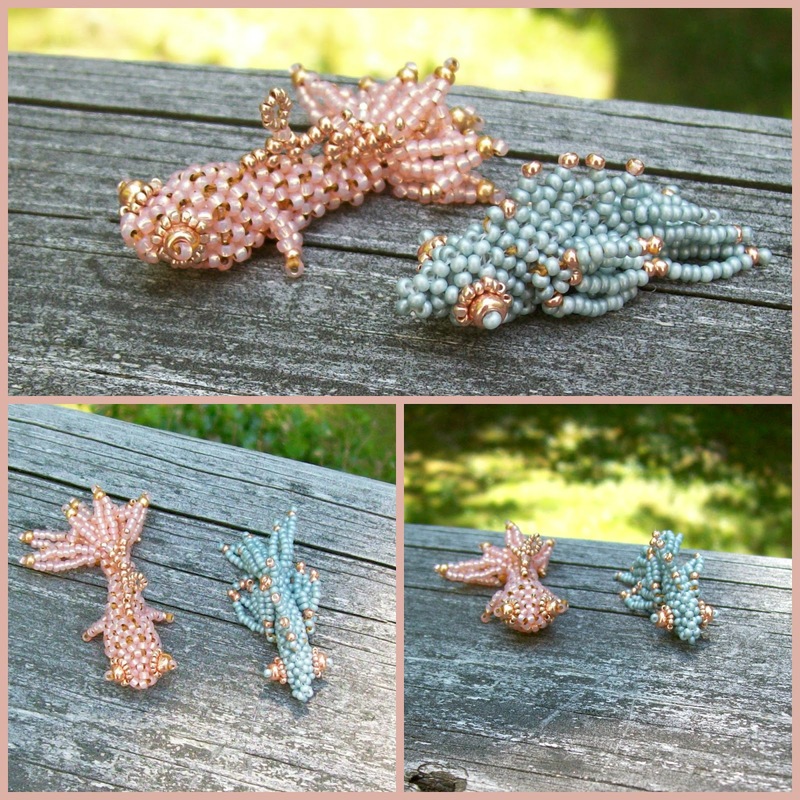 I added a beaded loop to one of the dorsal fins of the pink fish, but I think I will add a jump ring somewhere on the green fish! Check out the other participants here! Love your fish! This looks like it was a fun hop! Those came out so great! I wish I had the patience for seed bead work. well done! both are great, and your RAW stitch looks perfect! those are some nice look'n fish! Amy, I am so glad you joined in! Like you, I often find myself wanting to stop right after I get the tail and body together. It's such an elegant shape. Your two remind me of the tiny, brightly colored fish I used to admire so at the local pet store. And I have to agree with the earlier comment - your colors really do remind me of the seashore. Very nice. Great shapes and colors. Great fish, Amy! I love them both -- but especially the blue one with the awesome eyes. What's really cool is how everyone personified them. Wonderful work, Amy! Just love your fish and the color pallet you chose. I have to say I am enjoying everyone's variations. Your colors are so serene. I did not even try to stuff mine with a core bead. I used saran. I have heard of using felt- it was a success for you, maybe on one of my future projects I will give it a try. I have the tutorial, but have only half done. I need to practice my increase adn decrease RAW a bit. But Karen makes the best tutorials! I am back from Florida and just now getting around to the blog hop. I love your fish they both have such unique personalities and the colors are gorgeous. I was going to make more and make a mobile out of them, but did not get around to making more than one. I think I will make it into a pendant.